“I guess everyone wanted to see these bands before they die.” That was what I overheard a female concert-goer saying as I walked into the Lost ’80s Live show at North Seventh (AKA the Electric Factory) on Saturday, September 29, featuring Flock of Seagulls, Wang Chung, Dramarama, Gene Loves Jezebel and others. Though there was a decent size crowd, I was surprised that it was far from sold out. In fact, a few of my friends bought their tickets the week before the show for a discount on Groupon. As a kid who grew up on MTV in the ’80s, this was my chance to see a plethora of bands that I was too young to see in their heyday. It wasn’t common for parents to bring their 12-year-olds to concerts back then like it is now. One wonders what motivates these artists to go on tour so much later in life. Is it because of TV shows like Bands Reunited that are designed to unify bands that we loved from our youth? Is it the draw of a paycheck or just a love for performing? I will say that some of the artist aged better than others. Though they all appear so much different from their days making their music videos, it’s somewhat easy to tell (well, hear) if the original singer is still with the group. Those who have not following these eight featured bands for the past 30+ years might find it harder to trace the other band members. I decided that if they looked younger than me, there was no possibility that they could be original members. Given that there were so many bands on the lineup, each band only played a handful of songs including their big hits. Some may call this a collection of one-hit wonders of the mostly British New Wave. But those who continued to follow alternative music should hope to know a few more songs per set. Many of the band members made themselves available to sign merchandise after their sets, so it’s nice to see them connecting with their fans. I assumed that Annabella Lwin of Bow Wow Wow would have been given a more prominent spot in the lineup given the commercial success of the 1982 hit (and Target commercial), “I Want Candy,” but it turned out that her set was just her singing with pre-recorded music. She was a young teen back when “I Want Candy” and “Do You Wanna Hold Me” were first released. Now she seemed to be trying too hard to still capture her youth. I was cheering for her, but the performance was sadly flat. Dramarama was the only American band on the bill and received lots of appreciation for their hometown announcement of Wayne, NJ. Their hit “Anything, Anything” from 1986 (also featured on the soundtrack for “Nightmare on Elm Street 4”) has been stuck in my head since the show. Though they might not be as well-known as the other bands, with songs like “Last Cigarette” they held their own and are still touring around the original lead singer, John Easdale. “Always Something There to Remind Me” is the 1983 hit you would know from Naked Eyes. But don’t forget “Promises, Promises.” Pete Byrne sang and played guitar while the drummer was also backed up by pre-recorded music. Animotion’s Astrid Plane and Bill Wadhams still had their on-stage chemistry, and they sang the ever-popular “Obsession,” though part of me thought that I was watching a skit by Tracey Ullman. After some legal battles over the name, Clive Farrington and Andrew Mann make up what is now called When In Rome UK. “The Promise” from 1988 was given a new life when it was added to the “Napoleon Dynamite” soundtrack in 2004. You could tell that Farrington and Mann really enjoyed being up on stage together as they encouraged the crowd to sign along. We had a chance to talk with them briefly after the show, and I can’t get over how friendly and unpretentious they were. Wang Chung blew everyone away with their performance. And it wasn’t just because of the t-shirt that the night’s announcer was giving away that said, “Make America Wang Chung Again.. They started their set with “Let’s Go” to get everyone’s attention. “Dance Hall Days” from 1984 and “Everybody Have Fun Tonight” from 1986 were as crisp as when they first released them. Jack Hues on vocals and guitar along with Nick Feldman on bass along with their backing band had everyone up and dancing. 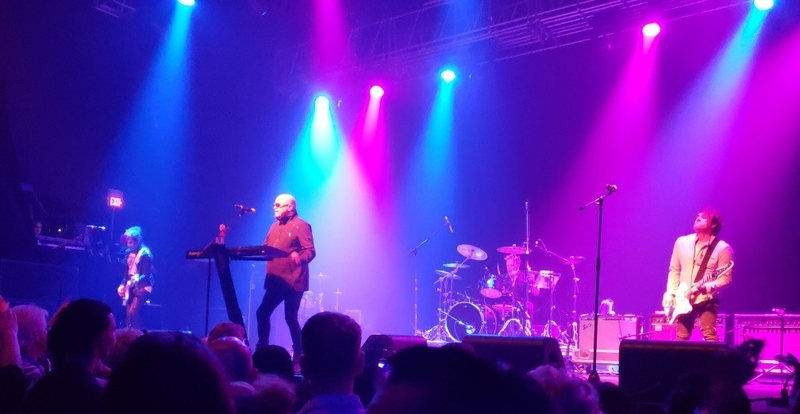 Flock of Seagulls are equally known for their 1982 hit, “I Ran” as well as vocalist and keyboard player, Mike Score’s crazy 80’s New Wave hair. Now they must rely solely on the music since Score’s hair appears to be long gone. “Wishing (I had a Photograph of You) and “Space Age Love Song” were other highlights. To my surprise, they released a new album this year, Ascension. But it was the not so lost 80’s hits that the crowd was there to see.